"I vote for the person, not for the party," Thomas Lee Stemple, a retired maintenance supervisor and registered Democrat, said a few hours before the parade. Interviews with West Virginia voters over the holiday weekend showed many of them intend to split their ballots between parties this November. The parade&apos;s two most prominent participants and Senate candidates — Rep. Shelley Moore Capito, a Republican, and West Virginia Secretary of State Natalie Tennant, a Democrat — used the event to promote their personal brands to voters gathered on the streets of this town north of Charleston. 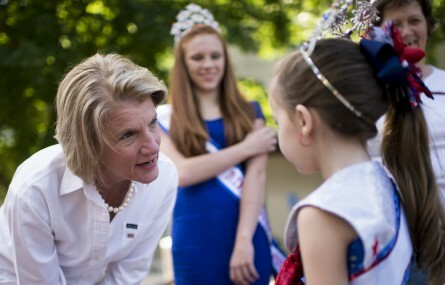 Capito was the first federal candidate featured in the parade of more than 150 floats. "This is my 18th campaign," Capito told CQ Roll Call in an interview next to her float a few minutes before the parade. "You are either running unopposed or running scared. ... So I&apos;m running scared." The Rothenberg Political Report/Roll Call rates the race as Leans Republican , meaning the GOP has a good chance of picking up this seat — held by retiring Sen. Jay Rockefeller — in its quest for Senate control. Capito is running strong, but Tennant is giving her a spirited challenge. If the Democrat is sweating this race, she isn&apos;t showing it, or at least she wasn&apos;t at this parade under sunburning heat. The congresswoman&apos;s polished personal style — complete with pearls —contrasted with the crowds of tank tops, tiaras and camouflage. The back of the congresswoman&apos;s shirt was emblazoned with Old Glory. Capito walked the route lined with spectators. At one point, the congresswoman stopped to give a high-five to a woman while a leashed pig stood about a foot away. Since Sen. Robert C. Byrd died four years ago, Capito is one of the most identifiable figures in West Virginia politics. But trailing behind her parade entourage, beauty queens outnumbered political candidates by at least 3 to 1. One of the queens was a young girl riding alone and unrestrained on the top of a minivan, but she garnered less attention than the “2014 Miss WV Roadkill” in a Ford Mustang convertible. 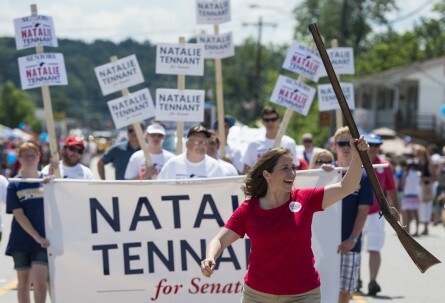 Tennant trailed Capito by a dozen or so floats, but earned cheers on par with her rival. Tennant&apos;s central case to voters is that she is relatable. If the underdog wants to win, she must distinguish herself from her national party and President Barack Obama, who is reviled in this state that was once a Democratic stronghold. Obama lost the state by 22 points in 2012. In an interview, Tennant mentioned "West Virginia" in nearly every other breath. "We&apos;re all West Virginians together, and that&apos;s how I&apos;m going to win it," Tennant said. "I&apos;ve won two statewide elections before. I know how to win a race. Congresswoman Capito&apos;s never run statewide before." Tennant&apos;s float featured a prominent photo from her college days depicting her dressed up like Daniel Boone — a reminder to parade watchers that she was the first female West Virginia University Mountaineer mascot. Instead of shaking hands, Tennant gleefully loaded and fired a musket before cheering crowds. Each woman boasts strong name recognition. Capito has served seven House terms and her father, Arch Moore, served as governor in the 1970s and 1980s. Tennant is a former local morning show television anchor. But in Ripley, people prefer to call each by their first names — Shelley and Natalie. Bill Clark contributed to this report. Related stories: Warning: Senate Races Aren&apos;t as Close as They Appear Tea Party Candidate Wins Republican Nod for Capito Seat Capito Leaves Vacuum in Race to Replace Her West Virginia Undergoing Political, Generational Change Get breaking news alerts and more from Roll Call in your inbox or on your iPhone.